How can the political regime under Xi Jinping be defined and what have been the outstanding features of the modes of governing under his first term? Beyond an unprecedented concentration of power in the President’s hands, can it be argued that this increased concentration of power has gone along with the party becoming more powerful? Conversely, what could be the traps of an increased centralization of power in terms of the longer term resilience of the Party-state? And in which respect have its conventional institutions and ruling mechanisms become ever more important in correcting some of the ills of a Hu-Wen rule which now somehow appears as an era of status-quo? 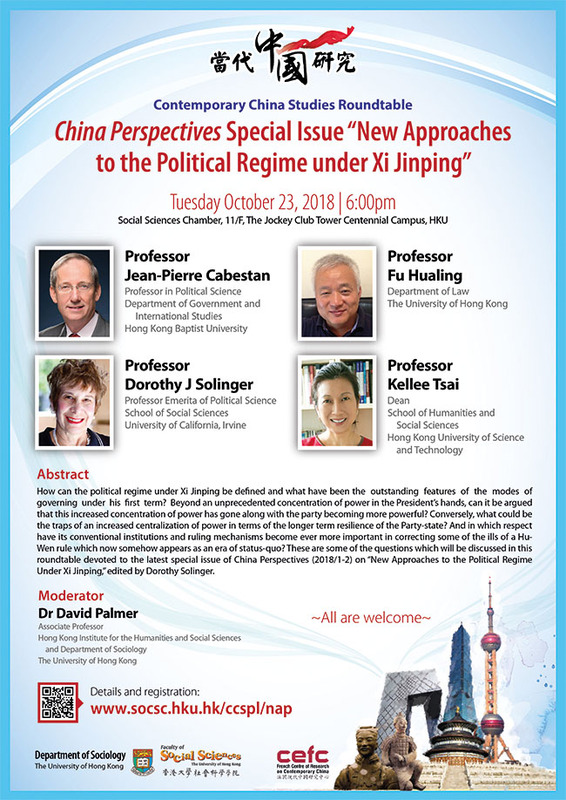 These are some of the questions which will be discussed by the participants to this roundtable devoted to the latest special issue of China Perspectives (2018/1-2) on “New Approaches to the Political Regime Under Xi Jinping,” edited by Dorothy Solinger. For more information, please visit the website of Contemporary China Studies Public Lecture.